If you have been using 3D Vision for a while now, then you probably hate to go all the time to the control panel and enable and disable the stereoscopic 3D support from there. I’m not talking about just “hiding” the stereo 3D mode wit the help of the button on the 3D Vision IR emitter or pressing Ctrl+T, but actually disabling the support for stereoscopic 3D when you are going to play a game in 2D (plain 3D mode). The reason for that is quite simple actually, because when you have stereoscopic 3D mode enabled from the control panel even if you are not using it (is not activated at the moment), you will be getting less performance from your video card as when playing with stereoscopic 3D support disabled from the control panel. So when playing a game in 2D you usually ave to disable it from the control panel to get the top performance and when finished playing and want to switch to 3D mode again, you need to enable it again. Axel Lux got tired from that as well and has created a small and useful application called 3D Vision Toggler to simplify this process and he is sharing his work with us, so we can also do the switching easier. 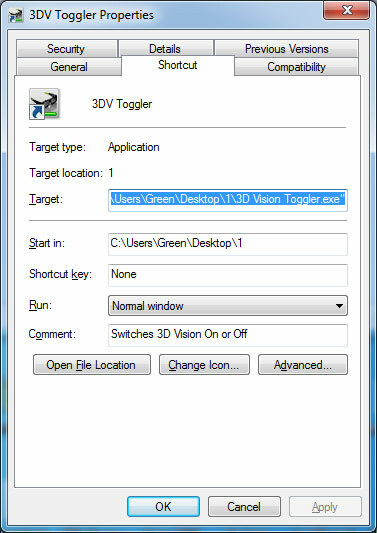 Running the 3D Vision Toggler for a first time will “install” it by making a shortcut on the desktop and an INI file with some parameters that you can edit in the folder where you have the executable file in. Clicking on the shortcut quickly enables and disables the stereoscopic 3D support and you can get a info balloon popping up in the system tray telling you what the current status is. You can even further make things easier if you set a shortcut key for the 3D Vision Toggler shortcut to make the toggling even simpler by just pressing a combination of keys. You can try the application and share your feedback below.